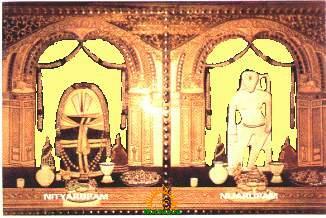 Chandanotsavam or Nijaroopa Darshanam is a major ritual celebrated on Akshaya Trutiya day at Simhachalam Sri Lakshmi Narasimhaswamy temple. In 2018, Chandanotsavam is observed on April 18. During Chandanotsavam, devotees can have Nijaroopa darshanam or the actual shape of Lord Lakshmi Narasimha swamy. On normal day, Simhachala Lord will be visible with Chandanam pootha (covering of sandalwood paste). On Vaishakha Shudda Thadiya (the third day in Vaishakha masam), the real form of the Lord with wild boar’s face, human trunk and lion’s tail will be exposed to public view. Of the four layers of chandanam to be applied to the deity, the first layer is applied after sahasra ghatabhishekam at 9 p.m. on Akshaya Tritiya day. The second layer on Vaisakha Poornima, the third on Jyesta Poornima, and the final chandanam pootha on Ashada Poornima. Akshaya Truthiya Chandanotsavam attracts millions of devotees from Andhra Pradesh, Karnataka, Orissa, Chhattisgarh, Pondicherry, and Tamil Nadu.